It has been nearly 40 years since Camper & Nicholsons Yachting ceased building large yachts in England, and Boat International was the first to see the superyacht design that will mark the rebirth of the C&N Yachting marque. C&N Yachting plans to share further details of its new superyacht at the Monaco Yacht Show this week, but they revealed details to Boat International and allowed us to publish this exciting news first. George Nicholson and C&N Yachting CEO Federico Bennewitz showed Boat International the just-finalised plans for the new 42m C&N Yachting 400 Series, which is planned to have a transpacific range. ‘Basically all the innovation is here, in the working part of the ship,’ Nicholson says, poring over the general arrangement for the C&N Yachting 400. The semi-custom steel-and-aluminium raised pilothouse yacht, designed by Horacio Bozzo, with engineering by Axis Group Yacht Design, has genuinely innovative features, including the Schottel drive propulsion and a creative tender-stowage solution. The tenders are held in self-contained, watertight, self-bailing pods at either side just under the aft deck, a solution the team deemed safer than a typical tender garage. A door opens upwards to reveal the tender, accessed from the crew on deck and launched via a simple gantry. The tender storage also influenced the style of the C&N 400, as the goal was to avoid a ‘yacht version of a trawler’ as Nicholson puts it. Bozzo gave her a sleek profile with minimal overhangs and expansive windows that Nicholson describes as ‘modern without being outrageous’, a look he hopes will stand the test of time. In terms of size, the C&N 400’s creators aimed to find the market’s sweet spot. ‘ the smallest boat with an all-ocean seagoing capability, comfortable for 10 people and 10 crew, which is the ultimate ratio – one-to-one – for service aboard,’ Nicholson says. ‘We think this is the smallest yacht that delivers the complete package without any compromise.’ It was inspired by Nicholson’s personal yachting experience, of which he says he had more enjoyable times in yachts under 60m than above, able to more easily access favourite cruising destinations and harbours. The C&N 400 takes a bold step in propulsion technology with its use of Schottel duo-prop, which the design team claims to be 15 per cent more efficient than conventional drives, albeit more expensive. Bennewitz says these have been proven by their successful use in commercial vessels in tough North Sea conditions for more than a decade. ‘They are reliable, ship-grade components,’ he says. As with pod drives, the Schottel drives pivot 360 degrees and allow for greater manoeuvrability and, when coupled with a bowthruster, dynamic positioning. They also take up much less space in the engine room, allowing the bulkhead between the living space and technical area to be pushed further aft to create spacious guest cabins. Yet relative to the size of the components, the engine room is still ample. Much thought has gone into crew accommodation and circulation – with a separate stairwell for crew connecting all decks. As she is planned for long passages, it was paramount to have good crew spaces indoors plus an outdoor crew area on the bow. 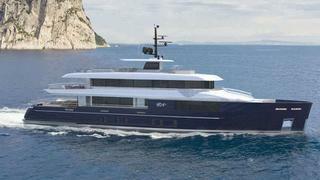 As for plans to build the first C&N 400, many options are being considered, including sub-contracting space at a shipyard or going forward with a dedicated C&N Yachting yard in Italy. Either way, there will be the option to build yachts up to 60m. For the next yacht that would continue ‘the renaissance of C&N Yachting’, as George Nicholson calls it, he refers to plans for a sailboat – one very different from anything Nautor’s Swan currently builds and that fits into the spirit of the new generation of C&N Yachting.